A very colorful display. I'm thinking that this might be kind of scary under the right conditions. The eyes look a little afraid that the bushes might grow too high! Love that giant peeping Tom! 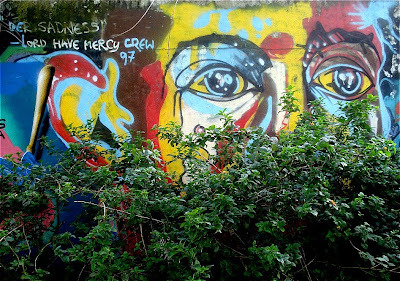 A beautiful mural, I liked those impressive eyes! *** teu header tá lindo!!!! Perfect title for this intriguing composition. Graffiti or art? Which ever it is, it has feeling! Wonderful color addition to the wall. A frightening and very colorful piece of graffiti! Great eye to catch this and very well composed, Jose! Funky shot! Que giro!! onde é isto? Really nice mural, so colourful and bright! Great photo, awesome title. Thanks for the laugh. This is different from the tiled wonders. Shows a more modern aspect to your city. Very fun, cool, artsy find, Jose'!